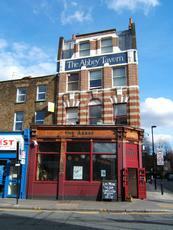 It's still called The Abbey Tavern, not "previously called", beer in the evening dot com. My first ever visit here on a Tuesday evening for a quick pint and to pay some money for a party I was throwing 2 evenings later. 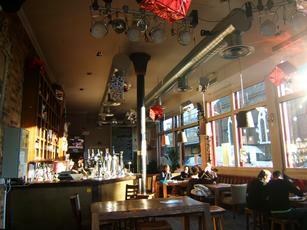 This large open plan street corner pub is pretty dark inside and has a full wooden floor. 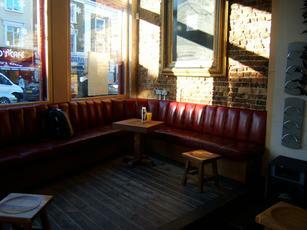 To the back of the pub past the kitchen is a small single room that hosts private events, this opens on to the large courtyard garden with heaters and covered areas for diners, drinkers and smokers. On the bar were 3 hand pumps that had 2 ales on these were Sharp’s Doombar & Sambrook's Pumphouse Pale. I instead opted for a pint of Five Points Brewing Company Five Points Pale @ 4.4% on keg, a nice pint with a price tag of £4.40. The open mic evening was being set up while we were here so we sat out in the garden area and then left before it started. My visit back here 2 evenings later for a party was very good and again the Five Points Pale was on good form. Great food at a good price (especially with the genius that is the WEDGE CARD). Occasional decent live music of an evening. However, cretinous bar staff that specialise in ignoring everyone whilst they text pals and fold napkins. Too many potentially pleasant sunday afternoons ruined by this to ever go back.